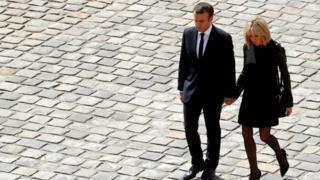 French President Emmanuel Macron is to abandon plans to create an official role of first lady for his wife Brigitte, according to reports. During his campaign, Mr Macron had said he wanted to create "a real status" for his wife. But an online petition against the move has gained almost 290,000 signatures. French media report that Brigitte Macron's position will be clarified in the coming days, but that the constitution will not be altered. In a TV interview during his presidential campaign, Mr Macron said that, if elected, he would want the role of first lady to be "defined". "She [Brigitte Macron] will have a say on what she wants to be," he told TF1 in April. Should France have an official 'first lady'? The French constitution gives no official status to a president's spouse, although they are typically allocated an office in the Elysée Palace, an assistant or two, and security guards. Part of Mr Macron's campaign was based on stamping out nepotism in French politics after his conservative rival Francois Fillon was investigated over controversial payments to his wife. Mr Macron said he would ban politicians from employing relatives in response to the public outcry over the scandal. French politician Thierry Mariana was one of several to publicly criticise the new French president for the move. "Do as I say, not as I do," he said in a tweet last month. An ally of Mr Fillon, he linked to an article about speculation over Mrs Macron receiving official status and a budget. Government spokesman Cristoph Castaner posted several tweets on Monday evening suggesting Mrs Macron's role would be clarified but no change to the constitution would be made. The tweet translates as: "No modification of the constitution, no new funding, no salary for #BrigitteMacron. Stop the hypocrisy!" Critics have suggested Mr Macron could be attempting to use his wife to improve his approval rating after a significant slump in some polls. Others have said the French President was attempting to copy the US model, however, the American role of first lady is also unofficial. Brigitte Macron: Should France have an official 'first lady'?